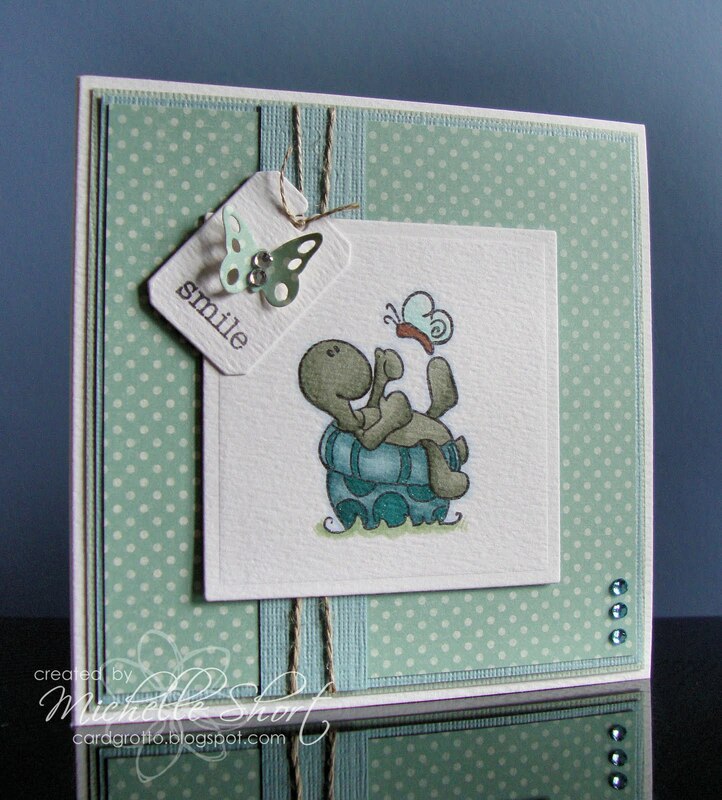 I made this card a few days ago using one of the lovely Stamping Bella stamps now available at DTDF. I have stamped the turtle out and coloured him with Copics and cut him out using a Nestabilities die. I have then added him to the base with 3d foam. The base is simply layers of Bazzill Hazel CS and SU! Baja Breeze followed by a layer of Memory Box Distressed Dots Thistle paper wrapped around with SU! Linen Thread. I have then cut a tag using the MFT Die-Namics Notched Tags set and stamped the 'smile' greeting from the set on it and then cut out a little butterfly, aslo from the same set, and added it with Bazzill Adhesive Jewels. Finished off with Doodlebug Jewels in the corner. STAMPS: Stamping Bella, My Favourite Things. INK: Memento Tuxedo Black. CS: Craftwork Cards, Bazzill Basics, Stampin' Up!, Memory Box. TOOLS: Nestabilities, My Favourite Things Die-Namics, Copic Markers. EMBELLISHMENTS: Bazzill Adhesive Jewels, Doodlebug Mini Jewels, Stampin' Up! Linen Thread. Another gorgeous card Michelle .... Love the layout.